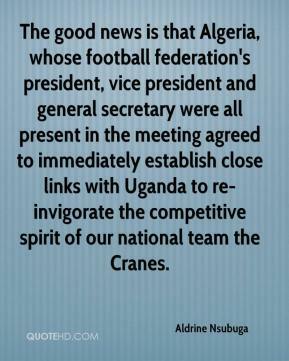 The general secretary knows everything and only he can give you the explanation. I am always ready to call the meeting. We had fixed a date but we failed to hold it because of illness of our general secretary. 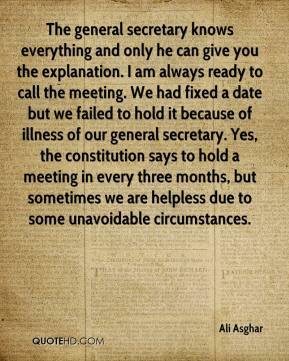 Yes, the constitution says to hold a meeting in every three months, but sometimes we are helpless due to some unavoidable circumstances. 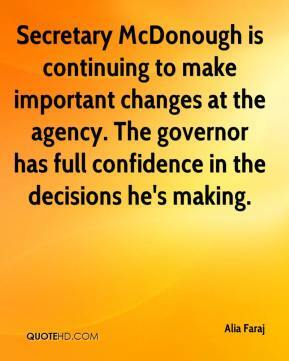 Secretary McDonough is continuing to make important changes at the agency. The governor has full confidence in the decisions he's making. 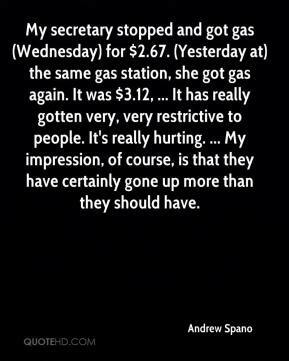 My secretary stopped and got gas (Wednesday) for $2.67. (Yesterday at) the same gas station, she got gas again. It was $3.12, ... It has really gotten very, very restrictive to people. It's really hurting. ... My impression, of course, is that they have certainly gone up more than they should have. 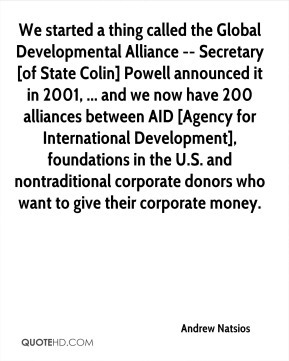 We started a thing called the Global Developmental Alliance -- Secretary [of State Colin] Powell announced it in 2001, ... and we now have 200 alliances between AID [Agency for International Development], foundations in the U.S. and nontraditional corporate donors who want to give their corporate money. A king and a queen are coming for a state visit, and the social secretary gets a call from a man who is close to hysterical. 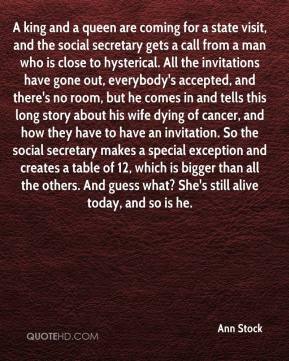 All the invitations have gone out, everybody's accepted, and there's no room, but he comes in and tells this long story about his wife dying of cancer, and how they have to have an invitation. So the social secretary makes a special exception and creates a table of 12, which is bigger than all the others. And guess what? She's still alive today, and so is he. 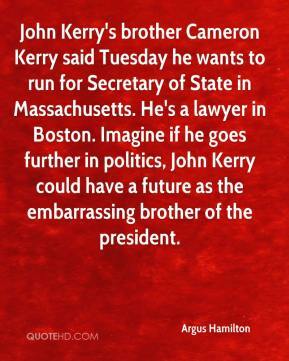 John Kerry's brother Cameron Kerry said Tuesday he wants to run for Secretary of State in Massachusetts. He's a lawyer in Boston. 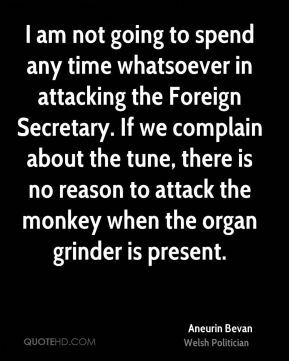 Imagine if he goes further in politics, John Kerry could have a future as the embarrassing brother of the president. Well, Secretary Ridge would have to speak for himself, but from my experience, you had someone who's got a history in law enforcement just looking at it from the standpoint, 'My goodness, we got intelligence here, we've got to raise the threat level.' But the Homeland Security has to consider, first of all, 'How does the public react to this? Does it measure up to the standards of credibility? 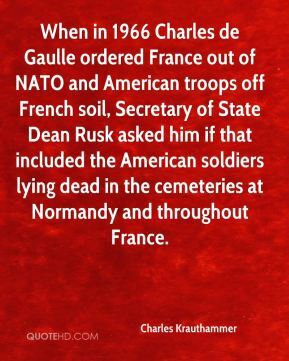 Is it something that we can act upon with an appropriate response?' 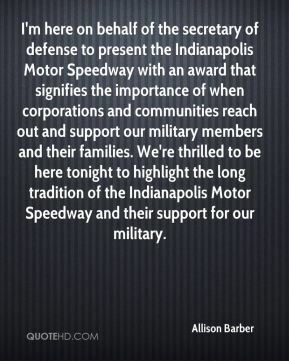 And, quite frankly, sometimes we realized the public couldn't do anything or law enforcement couldn't do anything. There was a push back saying, 'I don't know that we need to create the fear in the American public.' And, in fact, as you can see, as we got more experienced, the number of times we increased the threat level decreased in '04 as compared to '03. I believe it was four times or three times in '03. We reduced that by half in '04. And I think that's just experience getting better at it. Searle paid off the prosecutors by getting them fat jobs. 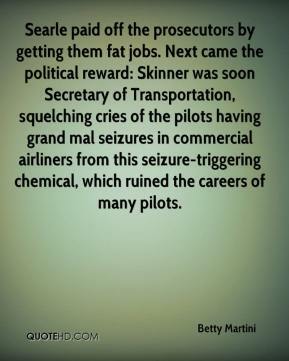 Next came the political reward: Skinner was soon Secretary of Transportation, squelching cries of the pilots having grand mal seizures in commercial airliners from this seizure-triggering chemical, which ruined the careers of many pilots. 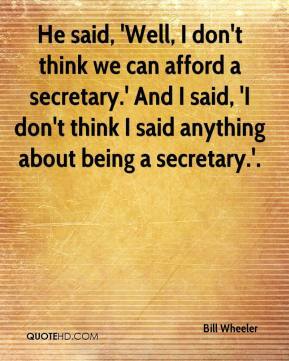 He said, 'Well, I don't think we can afford a secretary.' 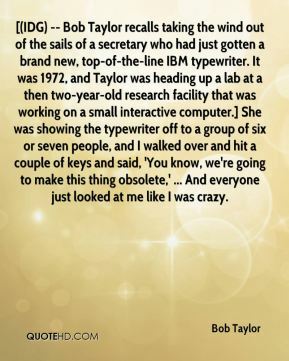 And I said, 'I don't think I said anything about being a secretary.'. One of the leading conservative voices in the country is trying to explain himself today. 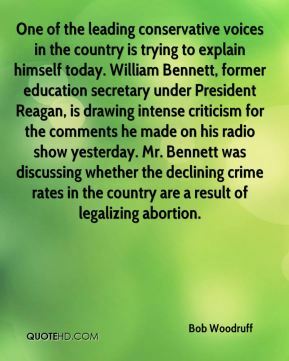 William Bennett, former education secretary under President Reagan, is drawing intense criticism for the comments he made on his radio show yesterday. Mr. Bennett was discussing whether the declining crime rates in the country are a result of legalizing abortion. 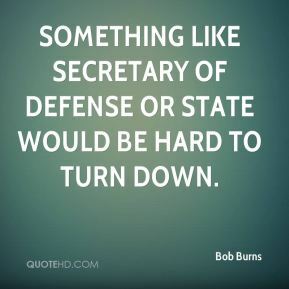 Something like secretary of defense or state would be hard to turn down. 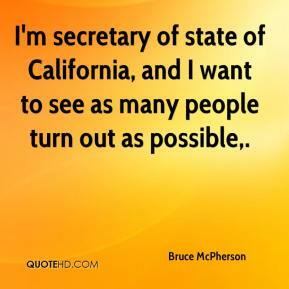 I'm secretary of state of California, and I want to see as many people turn out as possible. 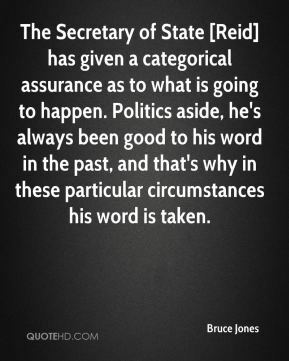 The Secretary of State [Reid] has given a categorical assurance as to what is going to happen. Politics aside, he's always been good to his word in the past, and that's why in these particular circumstances his word is taken. 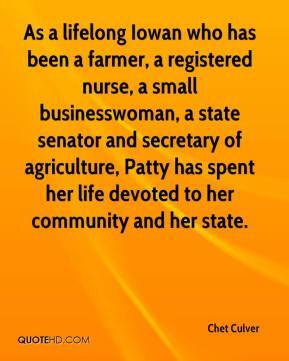 As a lifelong Iowan who has been a farmer, a registered nurse, a small businesswoman, a state senator and secretary of agriculture, Patty has spent her life devoted to her community and her state. 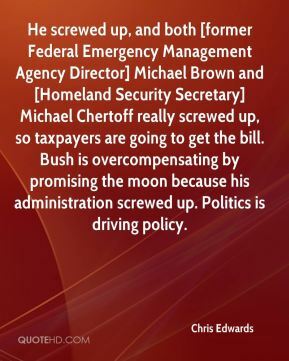 He screwed up, and both [former Federal Emergency Management Agency Director] Michael Brown and [Homeland Security Secretary] Michael Chertoff really screwed up, so taxpayers are going to get the bill. Bush is overcompensating by promising the moon because his administration screwed up. Politics is driving policy. 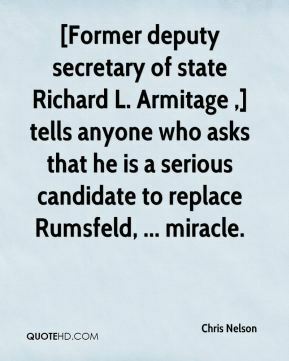 [Former deputy secretary of state Richard L. Armitage ,] tells anyone who asks that he is a serious candidate to replace Rumsfeld, ... miracle. 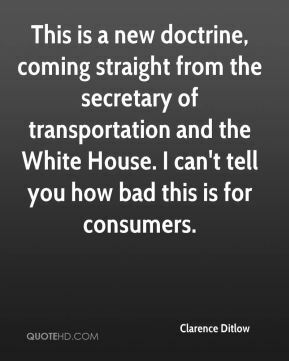 This is a new doctrine, coming straight from the secretary of transportation and the White House. I can't tell you how bad this is for consumers. 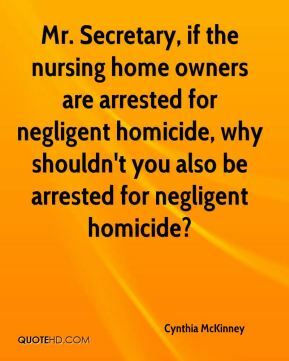 Mr. Secretary, if the nursing home owners are arrested for negligent homicide, why shouldn't you also be arrested for negligent homicide? The secretary-treasurer signs documents that the other supervisors don't sign. But you can sign those cards in 10 minutes. 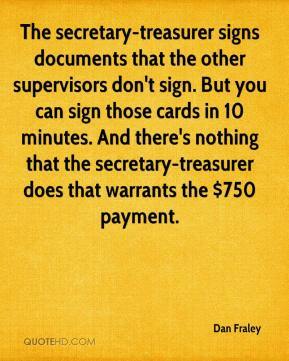 And there's nothing that the secretary-treasurer does that warrants the $750 payment. 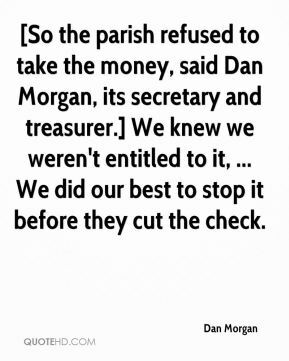 [So the parish refused to take the money, said Dan Morgan, its secretary and treasurer.] We knew we weren't entitled to it, ... We did our best to stop it before they cut the check.